Rotary President-Elect said that Ledia Koco was a wonderful example of the importance of the Interact Club at Chelsea High School. Koco, 25, was a member and president of the CHS Interact Club during her four years at the school. Interact Club is sponsored by the Chelsea Rotary Club and introduces students to the club’s service to the community and its international reach. For her outstanding efforts as an Interact leader and senior facilitator of Rotary Youth Leadership Awards (RYLA) her 1,000 hours of community service, and her continued work in the community, Koco was honored as the recipient of the Rotary Foundation of Rotary International’s Paul Harris Fellow Award at the club’s Installation of Officers Reception at the Homewood Suites Hotel. Past President Allan Alpert handled the formal presentation of the award to Koco. “All Paul Harris Awards are important and very distinguished, but this one is a little more special because it’s the members of the Rotary Club that honored you by making you a Paul Harris Fellow for all the things that you have done in your very short time here,” said Alpert. Koco is the daughter of Luan and Manjola Koco, who are originally from Albania. A former model who finished as first-runnerup in a major pageant, Ledia graduated in 2011 from Chelsea High where she was an honor roll student and member of the National Honor Society. She continued her education at Bucknell University in Pennsylvania, receiving her degree in International Relations and Spanish. Koco continued her membership in RYLA while at Bucknell, teaching other students in work force development. She is a member of the Chelsea Enhacement Team, which is a volunteer organization who participates in community service such as beautification efforts in the city. “Ledia is the administrative assistant to the Chelsea City Council and probably the youngest person that has ever held that very distinguished honor,” said Alpert. Koco humbly accepted the prestigious award. Koco said her commitment to public service began early in her life. 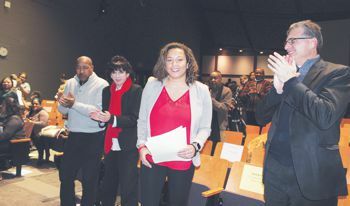 She thanked the Rotary Club for presenting her a college scholarship, along with helping to build her leadership skills. “The irony here is while Rotary is recognizing me, I feel like I should really be recognizing Rotary,” she added thoughtfully. Koco received a warm ovation from the many Rotary members and guests in attendance. 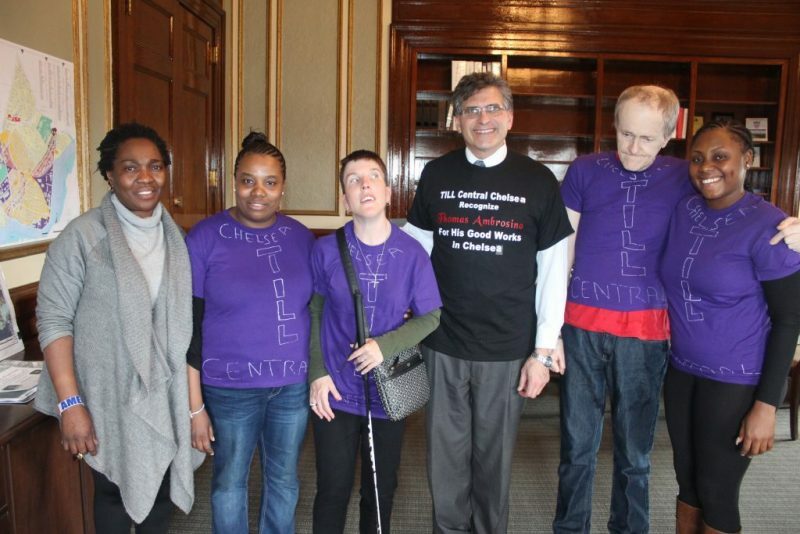 Pictured at the award presentation ceremony are (from left): Chinaza Okparaoko, Paula Jean, Stephanie Stevenson, City Manager Tom Ambrosino, Bruce Nicole, and Cordelia M. TILL Central Chelsea is an organization that assists people with disabilities and helps local organizations such as the Salvation Army, St. Rose Church, and My Brother’s Table in Lynn. 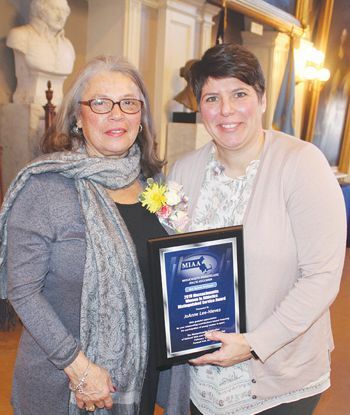 A Suffolk prosecutor assigned to Chelsea District Court was honored recently for her community-minded work in and out of the courtroom, District Attorney Daniel F. Conley said. During the 13th Annual Suffolk Awards, held last month at Suffolk University Law School, prosecutors, advocates, civilian investigators, and support staff were honored for their outstanding efforts on behalf of the communities of Boston, Chelsea, Revere, and Winthrop. Assistant District Attorney Stacey Pichardo was recognized with the Brian J. Honan Award for Excellence in the Courtroom and Commitment to the Communities We Serve – among the highest honors presented each year, and one that Conley said every prosecutor should aspire to. In addition to her day-to-day work arraigning, assessing, trying, and disposing cases in Chelsea court, Pichardo took part in this year’s Advanced Trial Training program, which brings young prosecutors and defense attorneys together from across Massachusetts to hone their trial advocacy skills. One of her mentors in that program, a senior prosecutor assigned to the DA’s Appellate Division, described her courtroom skills as “fantastic” and said she had a “polish” that was far beyond her three years on the job. Pichardo has earned the respect of police officers, detectives, and administrators in the course of her work, as well. 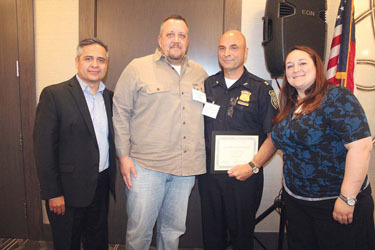 After speaking to criminal justice students at Bunker Hill Community College on the role of the prosecutor earlier this year, the students’ professor – Chelsea Police Chief Brian Kyes – called Pichardo a “superstar” who earned the class’ admiration and gratitude. Dan Conley; Honan’s mother, Mary Honan; and his sister, Clare Coughlin. 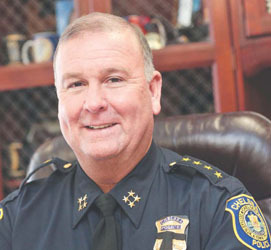 A 2008 graduate of Norwich University with a degree in criminal justice and Spanish, Pichardo went on to study at Suffolk University Law School. She interned alongside Suffolk prosecutors in East Boston Municipal Court and in Conley’s Gang Unit before she was hired as an assistant district attorney in 2013. The Chelsea Police Department is recommending the highest honors for Officer Dave Delaney after he selflessly dashed into a burning building on Cottage Street last Friday and helped to get two boys – both unaware of the fire – to safety. Delaney, 27, has been on the force about four years, and his father, a lieutenant, is also on the force. He also has two cousins on the Fire Department as well. Around 5:30 p.m. on Friday, he was working a utility detail when a pedestrian came up and alerted him to a fire. Another person ran up and told him where the fire was at, and Delaney ran to the scene. Once on the scene, he encountered a civilian who was in the process of busting down the front door to get inside, as there were residents in there. On the back porch, a huge blaze had ignited and was being fanned by the wind – moving fast into the third and second floor apartments. The civilian alerted the people on the third floor and helped them to get out, but no one was opening the second floor apartment and Delaney had a feeling someone was in there. The feeling was correct. The two young boys, 8 and 13, had not immediately heard him knocking. However, they did finally answer the door and it likely saved their lives. His persistence came from a lesson taught by St. Bevere during a major fire on Arlington Street a few years ago that consumed several homes. In that fire, Bevere said to go to all the houses and knock on the door until someone answers because someone could be in there and not immediately hear the banging. That, he said, was in the back of his mind as he continued pounding on the door Friday and the fire continued to come closer. In all, Delaney said he doesn’t feel he did anything out of the ordinary. As soon as Delaney got out of the house, Chelsea Fire arrived and the building was closed off for evacuations. Fire crews began fighting the fire at that point. The boys’ father arrived on scene about 20 minutes after they had been evacuated. Sgt. Thomas McLain indicated he would submit Delaney for the Lifesaving Medal due to his actions. Police Officer Dave Delaney is being recommended for the Department Lifesaving Award for helping to get two boys out of a burning building on Cottage Street last Friday.